Discover the newest version of cedar, an open source framework for cognition, embodiment, dynamics, and autonomy in robotics. Welcome to the cedar software! CEDAR is a C++ library for building and simulating large-scale dynamic field theory architectures. It places a particular focus on connecting such architectures to real sensors and motors, such as those of a robot. 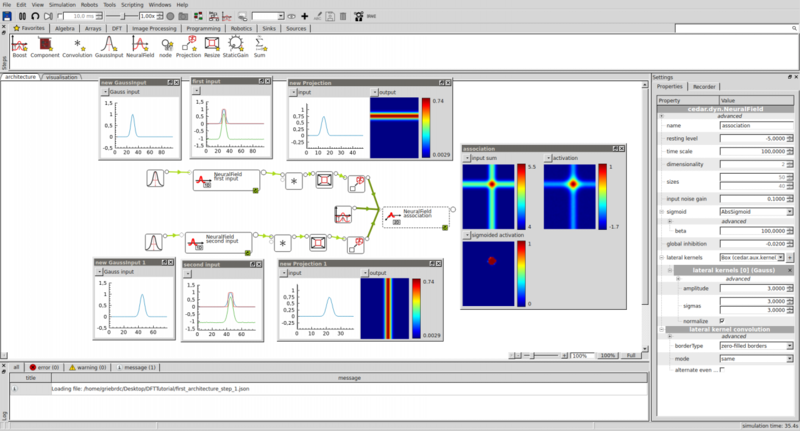 CEDAR has a powerful graphical interface that enables users to build architectures and connect to robots by drag-and-drop. You can get prepackaged versions of cedar in the downloads section. These are available for all major operating systems. If you would rather compile CEDAR yourself, you can get the source code from our repository. This is also the place to report any bugs or feature requests. If you have any questions regarding our software, send an email to cedar@ini.rub.de.